Friday, November 10, 2017 ~ 11:00 a.m.
Thursday, November 9, 2017 ~ 5:00 – 7:00 p.m.
Rosalyn J. “Rosie” Nietfeld, 82 of Ashland, NE passed away Monday, November 6, 2017 at Midlands Hospital in Papillion, NE. She was born January 14, 1935 in Fairbury, NE to Lester and Malinda (Meeske) Hummel. She was baptized and confirmed at Immanuel Lutheran Church in Daykin, NE. She attended District #81 grade school and graduated high school and college at St. John’s in Windfield, KS where she received her teaching degree and also attended classes at Concordia College in Seward, NE. She was united in marriage to Samuel D. Nietfeld on July 7, 1956 at Immanuel Lutheran Church in Daykin, NE. From this union four children were born. Rosalyn taught parochial grade school in Cleveland, OH where she also coached volleyball and later taught parochial school in Lincoln, NE. She worked and drove the bus for the school in Memphis, NE. She later worked for Reid’s Variety Store in Ashland, but most of all she was happy being a stay-at-home mom and a farmer’s wife. Rosalyn was a true educator, she taught Vacation Bible School, Sunday School, piano lessons, softball and was a 4-H Leader for 10 years. 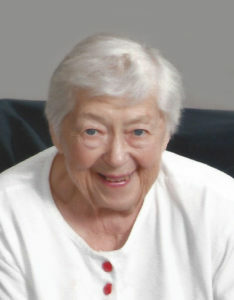 She enjoyed music, sports, traveling to the mountains and her family, especially her grandchildren and great-grandchildren. She is survived by her children, Kim (Larry) Houfek of Wahoo, Becky (Greg) Bierman of Gretna, Jeff (Toni) Nietfeld of Ashland, Shelley (Roger) Barber of Gretna; 10 grandchildren; five great-grandchildren; siblings, Horace (Ruth) Hummel, Kent (Joanie) Hummel, Shirley Schoenrock, Rachel (Stan) Peters; sisters-in-laws, Pat Tast, Connie Schroeder; many nieces, nephews and dear friends. She was preceded in death by her husband, Sam; parents; great-granddaughter, Rose Lynn Nietfeld. So very very sorry to hear this. Sending my deepest thoughts and sympathy. Hold close all the great memories. So Sorry in hearing the Passing of Rosie, She will be truly missed. My thoughts and sympathy goes out to Rosie’s Family May God Bless and Keep you at this time. So many good memories of Her. Our sincere sympathy in the passing of your Mom. Our thoughts and prayers to you and your families. Our sincere sympathy in the passing of your Mother, Grandmother and family. Our thoughts and prayers to you and your families. Blessings. So sorry for your loss. My thoughts and prayers go out to all the family. Our thoughts and prayers go out to Rosie and her family. May she and her family find peace and comfort of the Lord.